Disease of the spinal discs can take many forms. Significant disc damage can lead to a Bulging Disc, become a tear called a Disc Herniation or the inner gelatinous material of the disc can leak out in the case of a Ruptured Disc. 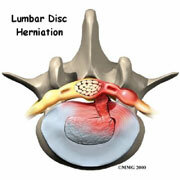 The "jelly center" of the disc can also dry out over time which is referred to as Degenerative Disc Disease. All forms of disc injury can eventually impinge on the nerves exiting the spine ("Pinched Nerve") which can create numbness, tingling, burning or sharp pain down the arms or legs. Sharp pain originating from the back and "shooting" down the legs is often referred to as Sciatica. The most effective treatment available to heal a Bulging Disc is Non-Surgical Spinal Disc Decompression. A Bulging Disc occurs when the tough outer fibers of the spinal disc weaken and stretch allowing the "jelly center" of the disc to "bulge" outward. 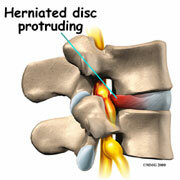 A Disc Bulge is generally considered the first step toward a more serious problem called a Herniated Disc. A Herniated Disc is similar to a Disc Bulge except that the outer layers of the disc actually weaken to the point of tearing. The majority of symptoms caused by a Bulging Disc are related to irritation of spinal nerves. These nerves exit the spine through small holes called foramen. The spinal discs are located next to these nerve passageways. The bulging of the disc material caused by a Bulging Disc can "pinch" these nerves creating a variety of uncomfortable and sometimes debilitating symptoms.